Run lengths are decreasing by an average of 7 to 9 percent each year, and as digital technology quickly evolves, digitally printed jobs are becoming more economically viable. Digital inkjet color presses capable of producing high densities, finer dots and faster speeds are propelling the digital printing growth. The North American tag and label industry is considered one of the most innovative of the print segments. Digital technology has transformed the way labels are designed, specified, sourced and delivered. In 2013 an estimated 9 to 10 percent of its work was produced on digital printing presses. Digital production volumes are projected to grow at 17 to 18 percent CAGR over the next five years. 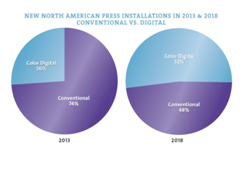 As a result, the percent of digital press installations will exceed those of conventional presses by 2018. Source: PRIMIR 2014 study “Tag and Label Printing Trends” by LPC and AWA. The part of the label market directly addressed by digital production presses is the pressure-sensitive sector, which accounts for about 33 percent of all labels. It also represents the fastest-growing and highest value sector of the overall market with retail prices for finished labels totaling $50 billion in worldwide annual sales. Digital presses have been successful at integrating themselves into the physical workflow of PS label manufacturing and have reduced process costs for short run levels. This has increased the value of labels that are customized or that can be made available on very short notice. Users of analog pressure-sensitive labels have accepted and adopted digital presses running alongside flexo UV technology. Although the surface area printed by digital presses represents less than 1.5 percent of analog printed PS labels, the value of those digital labels, as a share of analog value is closer to 3 percent. Demand for digital labels has been stimulated by HP’s integrated marketing from the back of the value chain (manufacturing) to the front (brand owners) through the education and nurturing of all the players. This is an activity that lifts all boats on the tide and was among the most interesting and important activities in the market during 2013 and into 2014. It is a signpost for the future of other markets for digital packaging. EP technology continues to dominate the digital label press market with HP Indigo the leader with ElectroInk technology. The rest of the market is mostly taken by UV inkjet presses from more than 10 suppliers with EFI-Jetrion as the leading supplier to date. 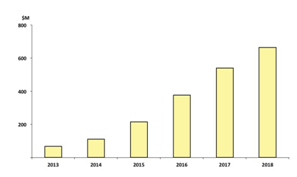 This InfoTrends chart shows global gross billings for folding carton printing from companies that use color digital presses such as HP Indigo, Xeikon, Xerox, Screen, etc. for folding carton printing. This type of printing has been a side application for narrow web label presses for several years, and Xerox has been placing its sheet-fed, narrow format iGen press in this segment since 2010. This mix of web and small, sheet-fed type printing of folding cartons will continue, although it will be dwarfed over the next few years as B2-size sheet-fed presses for folding cartons (such as the HP Indigo 30000) reach the market.